Join AAJA-MN at 6:30 p.m. Dec. 9 at Chatterbox Pub as we celebrate the launch of former chapter president Thomas Lee's book, "Rebuilding Empires." 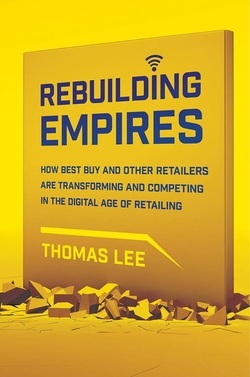 "Rebuilding Empires" examines, through retail giants Best Buy and Target, how big box chains are constructing a new future by utilizing mobile devices, social media, and the Internet, the same technologies that once pushed them to the brink of irrelevance. This book features interviews with industry leaders and experts, including Best Buy CEO Hubert Joly, chief financial officer Sharon McCollam, Target chief marketing officer Jeff Jones, and several other key players in both companies. Bricks and mortar retailing is not dead, and Best Buy shows others how to capitalize on their own physical spaces. Lee shows how showrooming is an asset rather than a liability, how physical space and online space are complementary, and how others can learn from Best Buy's innovations including the Geek Squad, stores within stores, and creating non-traditional partnerships. Lee, currently a business columnist at the San Francisco Chronicle, explores how the world’s largest consumer electronics retailer is redefining what it truly means to be a "Best Buy" in the age of online retailing.